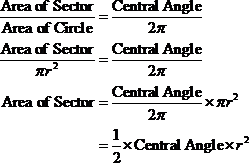 The following table gives the formulas for the area of sector and area of segment for angles in degrees or radians. Scroll down the page for more explanations, examples and worksheets	for the area of sectors and segments. A sector is like a "pizza slice" of the circle. It consists of a region bounded by two radii and an arc lying between the radii. The area of a sector is a fraction of the area of the circle. This area is proportional to the central angle. In other words, the bigger the central angle, the larger is the area of the sector. 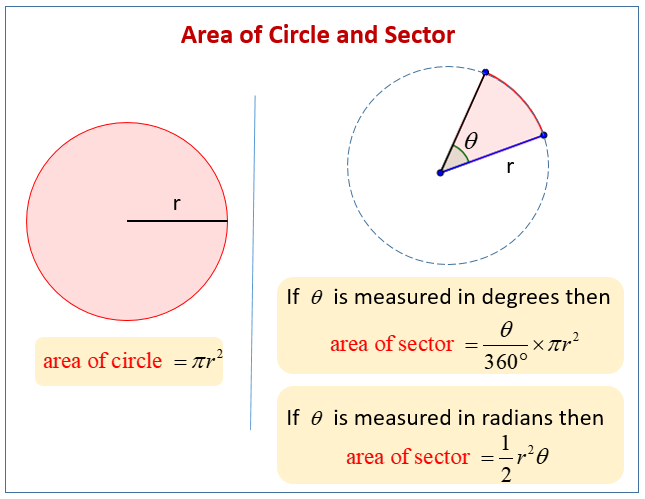 The following diagrams give the formulas for the area of circle and the area of sector. Scroll down the page for more examples and solutions. We will now look at the formula for the area of a sector where the central angle is measured in degrees. Recall that the angle of a full circle is 360˚ and that the formula for the area of a circle is πr2. Comparing the area of sector and area of circle, we derive the formula for the area of sector when the central angle is given in degrees. This formula allows us to calculate any one of the values given the other two values. We can calculate the area of the sector, given the central angle and radius of circle. Given that the radius of the circle is 5 cm, calculate the area of the shaded sector. (Take π = 3.142). We can calculate the central angle subtended by a sector, given the area of the sector and area of circle. The area of a sector with a radius of 6 cm is 35.4 cm2. Calculate the angle of the sector. (Take π = 3.142). It explains how to find the area of a sector of a circle. The formula for the area of a circle is given and the formula for the area of a sector of a circle is derived. Janice needs to find the area of the red section of the circular table top in order to buy the right amount of paint. What is the area of the red section of the circular table top? Step 1: Find the area of the entire circle using the area formula A = πr2. Step 3: Multiply the fraction by the area of the circle. Leave your answer in terms of π. How we can calculate the area of a sector using the formula in degrees and how to find the missing radius after you are given the sector area and the size of the central angle? Example 1: Find the area of the shaded region. Next, we will look at the formula for the area of a sector where the central angle is measured in radians. Recall that the angle of a full circle in radians is 2π. Comparing the area of sector and area of circle, we get the formula for the area of sector when the central angle is given in radians. The following video shows how we can calculate the area of a sector using the formula in radians. A lawn sprinkler located at the corner of a yard rotates through 90° and sprays water 30ft. What is the area of the sector watered? How to determine the area of a sector? The formula is given in radians. How to determine the area of a segment? (the area bounded by a chord and an arc). Example 2: Find the area of the shaded region in the circle with radius 12cm and a central angle of 80°. The segment of a circle is a region bounded by the arc of the circle and a chord. The area of segment in a circle is equal to the area of sector minus the area of the triangle. How do you find the area of a segment of a circle? It uses half the product of the base and the height to calculate the area of the triangle. How to calculate the area of sector and the area of segment? It uses the sine rule to calculate the area of triangle.